Besides palms, nolina, strelitzia, and coffee, Dutch seed trader and nursery Aardam started nursing tea plants some time ago. 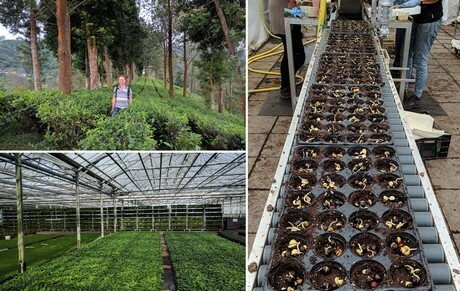 Arthur Spruit, who regularly goes on business trips to tropical places many can only dream about, was recently in Indonesia to talk with the seed suppliers. 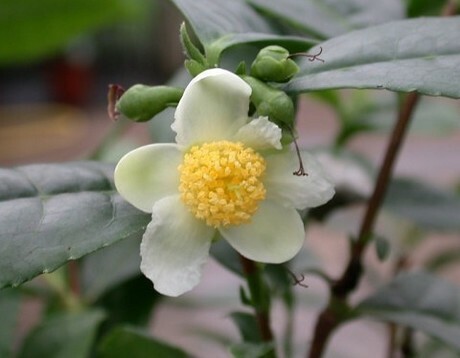 Tea (Camellia sinensis) is grown in many places all over the world. Tea grows in bushes from which the fresh, soft-green leaves are picked, dried, and mixed with other plant materials & ingredients, creating a large variety of tea types. So far so good, but you do have to know that the bush only creates flowers (and thus seeds) if treated properly. If you pick all the leaves, the flowers do not get the chance to develop. Beforehand, agreements have to be made for the production of seeds. Arthur: "The seeds we use come from Indonesia and Nepal. For sourcing, it is essential to make good agreements with your suppliers about the manner of harvesting and shipping. It has to be done with precision, because the seeds sprout best when fresh, and moreover, obtaining the required permits is not always easy." "When we receive the seeds, they are treated and placed in the germination chamber where the seeds sprout. Every week, we look through the seeds and take out the sprouted ones. We plant these in degradable jars and cultivate them in the greenhouse. After some months of growing, we sort the plants on size, remove the plants which have not grown properly, and supply them to the grower. The grower cultivates the young plant to a plant suitable for sale." The seeds in the degradable cultivation pots and on the right an order ready for shipment. Below again Arthur, with a tray of tea plants. The plant can be sold as tub plant or even as hedge plant, but also as a plant intended for making tea. "Especially to supply those customers, we do not use any chemical crop protection agents in the cultivation. This means we have to exert control with biological means and treat pathogens with natural enemies. We are also looking for various kinds of tea, so the customer can blend. We already have various kinds of tea from six origins in our assortment." 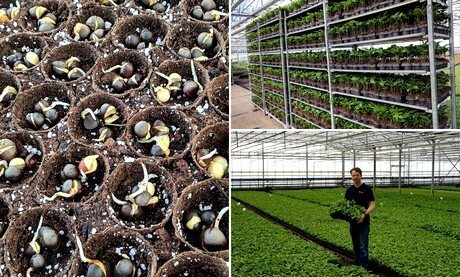 Nursery Special Plant Zundert is one of Aardam's customers. In cooperation with them, the brand 'tea by me' was introduced on the market, and agreements have been made with regard to quality standards and the form of the plant. "With this form of chain cooperation, we try to produce the best product possible."